Drifting dust burying farm abandoned farm equipment. In: "Effect of Dust Storms on Health," U. S. Public Health Service, Reprint No,. 1707 from the Public Health Reports, Vol. 50, no. 40, October 4, 1935. Digital image. NOAA Photo Library. National Oceanic and Atmospheric Administration, n.d. Web. 16 Aug. 2015. <http://www.photolib.noaa.gov/htmls/wea01418.htm>. After the Civil War, many families were lured to the Great Plains region by the Homestead Acts. The Homestead Acts gave men over 21 who had never taken up arms against the United States grants of 160 acres. The men could own the land outright after 5 years if they could show that they made improvements to the land. The completion of the transcontinental railroad in 1869 also lured people westward. The railroads had been given huge tracks of land along the route which they now could sell to people interested in moving west. Many new immigrants who came after the Civil War moved west to escape crowded conditions in the cities. The problem was that the Great Plains was (and is) basically a desert. It was a huge expanse of grassland that lacked rivers or streams. People who farmed in the area were dependent on rainfall. For many years there was adequate rainfall and the crops, mainly wheat, did well. In fact, the wheat grown in this region fed the United States and its allies during World War I. After World War I, the demand for wheat fell. In addition, a good part of the Great Plains region started to experience drought conditions that lasted for about a decade. Bryson, Bernarda. A Mule and a Plow--Resettlement Administration--Small Loans Give Farmers a New Start. Digital image. A Mule and a Plow--Resettlement Administration--Small Loans Give Farmers a New Start. Library of Congress, n.d. Web. 22 Aug. 2014. Dust storm approaching Stratford, Texas. Digital image. Wikimedia Commons. NOAA George E. Marsh Album, 7 Mar. 2005. Web. 16 Aug. 2015. 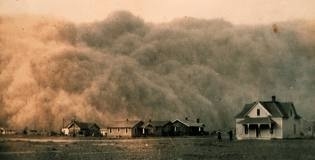 What was it like to be a dust bowl farmer? Click on the picture or title above to go to the Interactive Dust Bowl activity associated with Ken Burn's The Dust Bowl documentary. Bryson, Bernarda. Years of Dust--Resettlement Administration--Rescues Victims--Restores Land to Proper Use. Digital image. A Mule and a Plow--Resettlement Administration--Small Loans Give Farmers a New Start. Library of Congress, n.d. Web. 22 Aug. 2014. The Resettlement Administration was a New Deal program that ran from April 1935 to December 1936. The purpose of the Resettlement Administration was to help small farmers on marginal lands resettle to other parts of the United States. 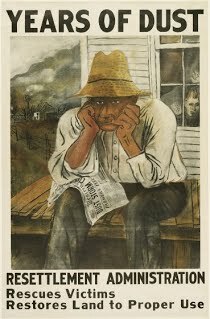 This included farmers in the Dust Bowl regions. The Resettlement Administration also create short films to show the plight of dust bowl farmer to the general public. Click on the title or picture to read more about the the Resettlement Administration. The short film/newsreel that you are going to watch is one of the films created by this agency. After you watch the film, please answer the questions in the document provided in Google Classroom. "The Plow That Broke the Plains (1936)." YouTube. Franklin D. Roosevelt Presidential Library and Museum, 20 June 2013. Web. 16 Aug. 2015. <https://youtu.be/hzaV5FdZMUQ>.